It is said that gold enhances the beauty of the wearer. I don’t know about that, but I believe that La Prairie took this saying more literally. 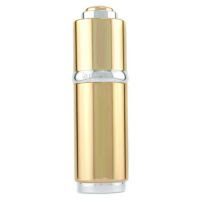 Cellular Radiance Concentrate Pure Gold is a serum made of interesting ingredients: pure gold, quartz, and liquid crystals. I don’t know if they are really working as an anti-age serum, but I’m interested to find out.